With Google Drive, you can keep all your important files in one place, then open them with your choice of apps and devices. Using the new Google Drive plug-in, people using Office for Windows can now open their Word, Excel and PowerPoint documents stored in Drive, then save any changes back to Drive once they're done. 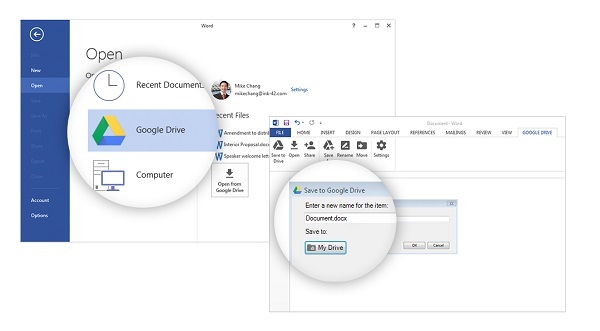 Google Drive plug-in for Microsoft Office makes it easy to create and edit Office files stored in Google Drive. If you're working on a document, spreadsheet or presentation that's on your computer, you can also save that file to Google Drive, directly from the Office apps. This is especially useful for sharing files with teams, or for accessing your files across devices. With this plug-in, you can use the apps you're already comfortable with, while benefitting from the security and convenience of Google Drive.